No one knows the Ikarian lifestyle better than Chef Diane Kochilas, who has spent much of her life on the island. 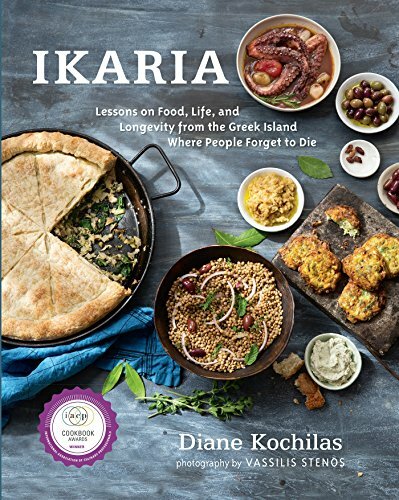 Part cookbook, part travelogue, Kochilas's Ikaria is an introduction to the food-as-life philosophy and a culinary journey through luscious recipes, gorgeous photography, and captivating stories from locals. Capturing the true spirit of the island, Kochilas explains the importance of shared food, the health benefits of raw and cooked salads, the bean dishes that are passed down through generations, the greens and herbal teas that are used in the kitchen and in the teapot as "medicine," and the nutritional wisdom inherent in the ingredients and recipes that have kept Ikarians healthy for so long. Ikaria is more than a cookbook. It's a portrait of the people who have achieved what so many of us yearn for: a fuller, more meaningful and joyful life, lived simply and nourished on real, delicious, seasonal foods that you can access anywhere.